No. 6 in a series of posts on books I've bought but haven't got round to blogging about properly – indeed may never get round to blogging about properly – so this will have to do. NB: linked in Friday's Forgotten Books, 8/4/16. The first British paperback edition of Dashiell Hammett's classic 1929 noir novel Red Harvest, published by Panther in 1958. 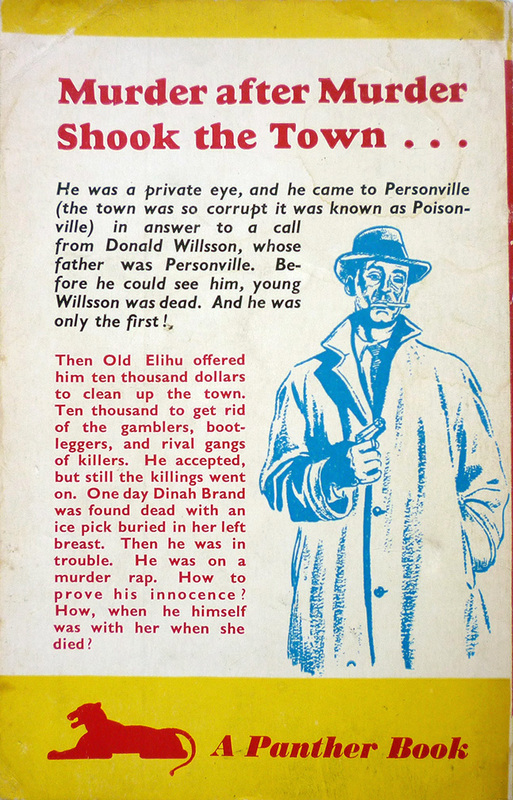 John Vernon, who also illustrated the 1957 Panther edition of The Maltese Falcon; perhaps that's why the Continental Op on his Red Harvest cover bears a passing resemblance to Humphrey Bogart (who played Sam Spade in the 1941 John Huston film adaptation of The Maltese Falcon). Where and when did I buy it? It was a bit of an impulse purchase. I'd been on the hunt for an affordable first edition/first impression of the The Dashiell Hammett Omnibus (Cassell, 1950), and managed to find one, in its dust jacket, on Amazon Marketplace for under twenty quid (see previous post). 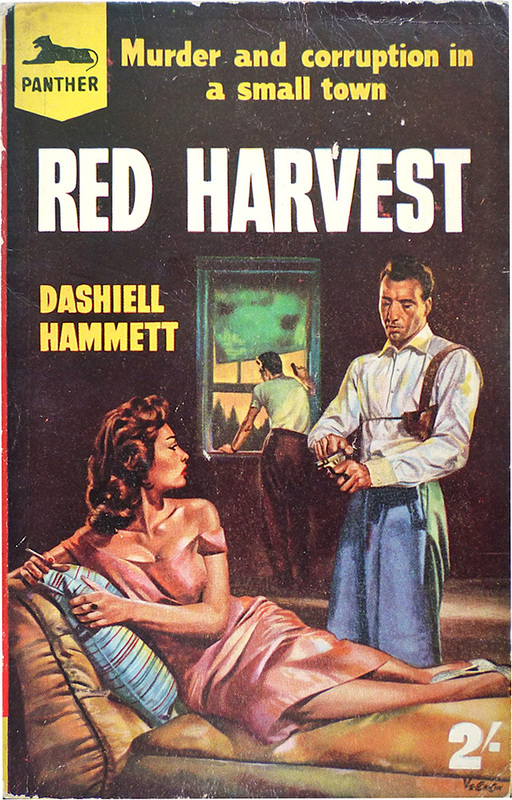 At the same time I spotted this paperback of Red Harvest on eBay, and even though Red Harvest is one of the novels in The Dashiell Hammett Omnibus, I couldn't resist snapping up this rare first British paperback edition of Red Harvest too. In my defence, at least it means John Vernon's cover is now freely available to view online – possibly the first time that's been the case. Have I read it yet? Interesting that he made the Op look like Bogey on the cover. Makes me wonder what a John Huston version of Red Harvest would have been like. Probably similar to The Maltese Falcon, so faithful to the book that the book was practically a screenplay. And that would have been fine with me. I usually hate film adaptations that stick so close to the source material, but it certainly worked for Falcon. Huston also did a very faithful adaptation of W.R Burnett's The Asphalt Jungle--just read that recently, and a lot had to be left out, but there's very little that got changed (the ending a bit). That book really is the foundation stone of the modern heist genre. But as literature, it doesn't quite hold up the way the film does as cinema. I think the Op is harder to translate to the big screen than Sam Spade (would have been hard to get around the fact that he doesn't have a name in a movie of that era). Frankly, I like the Huston/Bogey Spade better than the smirking blonde of the novel. Huston was good at cutting away the bits of a novel that don't work, seeing what would play onscreen and what wouldn't. I don't think anybody could improve on Red Harvest. Or make a better homage to it than Kurosawa's Yojimbo.